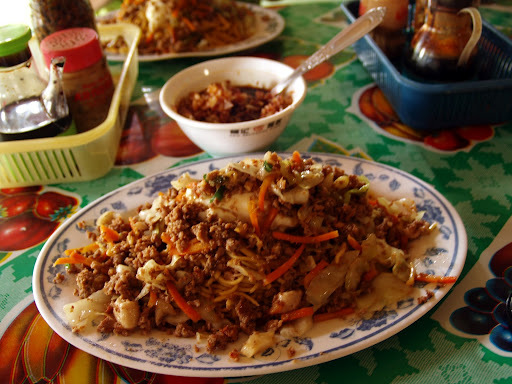 I wouldn't be surprised if Anthony Bourdain and his crew find their way to the northern tip of the Philippines to try the much loved Batil Patung. 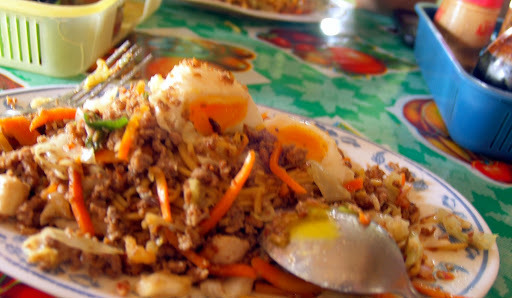 Batil Patung is the local version of stir fried noodles served with an egg topping (patung). and a side serving of egg drop soup (batil). Of course the dish is served with condiments --- soy sauce and spicy vinegar with lots of raw onions, that make this noodle dish unique. Minutes after leaving our house, our car is rumbling along an unpaved street wherein I can feel every bump on the road. We come upon a driveway (eskinita) lined with a fence made of dried bamboo. Locals say that it's not a legit panciteria if the restaurant is located in a new building with a modern facade. That being said, I can check this on the list and state that Lamud's Panciteria is definitely legit. 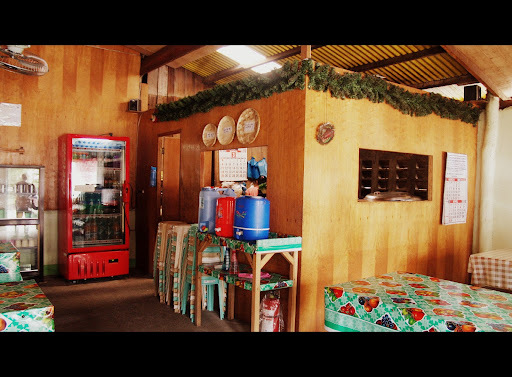 Lamud's is quaintly situated in a small village (or barrio), the place is very much in an unexpected location and it could easily be mistaken for a barn. 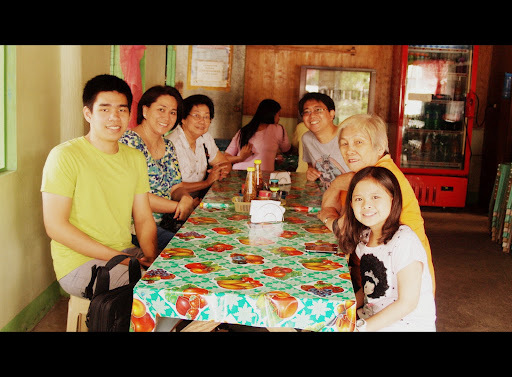 Panciterias in my hometown seem to sprout on every corner but I was told Lamud's is one of the popular pancit joints. Let's see why. Here you go... what you see is what you get, no more... no less! ...meet the youngest adventurer of the batil patung troop. While our order was being prepared... our master pancit guru shows us how to mix the condiments. "Red onions are best", Nicnic declares. Then add calamansi (lemon), pepper, just a little soy as the pancit is already tasty, and then the spicy vinegar" so he said. 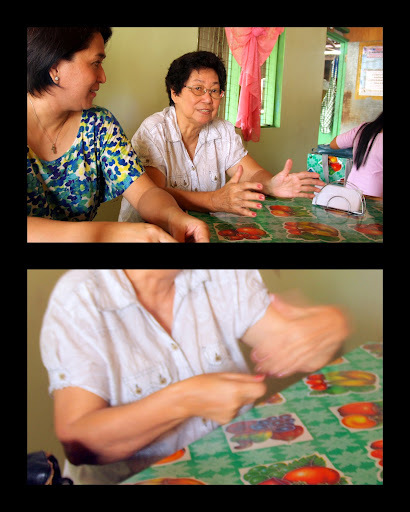 Then Tita Bess started to teach us how to eat the noodles: "You hold the fork with your right hand, and the left hand drives the flies away...", hahaha! 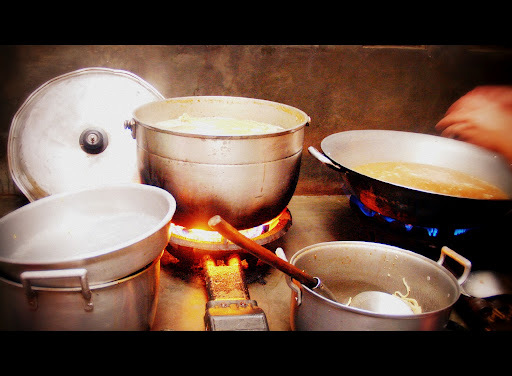 I sneaked into the kitchen and saw vats of soup stock continuously cooking. The ingredients are secret but it is the multiple hours of cooking that brings the rich flavor that for me is so comforting. But oh well, luckily my Mama knows her so I took more pictures. And I got more tidibits of information. 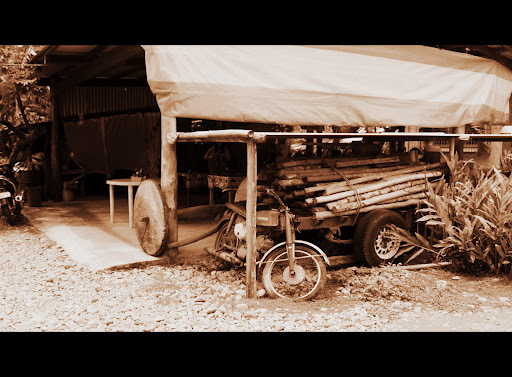 It is said that Batil Patung is a breakfast dish among butchers. In the wee hours in the morning when they prepare their meat to sell in the market, they ground the portion that is not selleable; this explains why the meat used is ground beef and the original recipe has liver on it (as liver is best eaten fresh). Since it's for breakfast, a poached egg is added on top of each serving. One of the reasons why people trek to Lamud's is because Gloria is a well known butcher in the area. 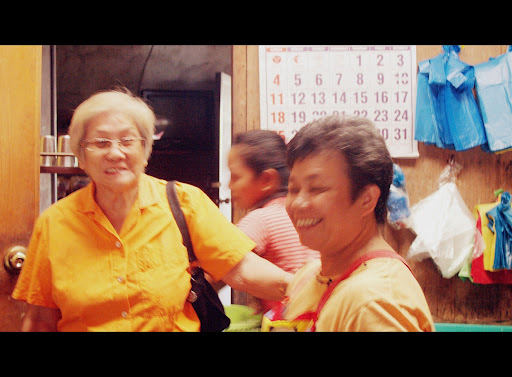 She has supplied beef to the local market for many years (and that's how Mama knows her). Customers know that the meat that she adds to the noodles is beef and not the cheaper alternative of cara-beef. Lo and behold, the steamy plate of freshly cooked pancit is served. The familiar aroma takes me back in time. The thick steam (plus remember the room has no AC) causes your face to form beads of sweat and you know the feeling of warmth enveloping you, steering you to total pancit nirvana, as most locals can attest. The poached egg, once broken, gives a silky texture to the already smooth noodles cooked al dente and is good to the last bite. Mid way through our meal, and still wiping those beads of sweat around my forehead, the egg drop soup is served. Its earthy flavor puts the meal to its climax... then I reached out to sip an old time favorite orange soda, to make the whole experience similar to my favorite childhood meal. This has been the most organic batil patung experience I've had in years. From the ambience, to the scent, to the piquant taste and flavor... all in all contributed to the awakening of my hometown palate. It was superb! I had shared my batil patung experiment here before. The only change I did was to remove the sausage and replaced it with longanisa (Filipino sausage). So here's my take on the dish. The huge serving gave my nephew S a shock, haha! 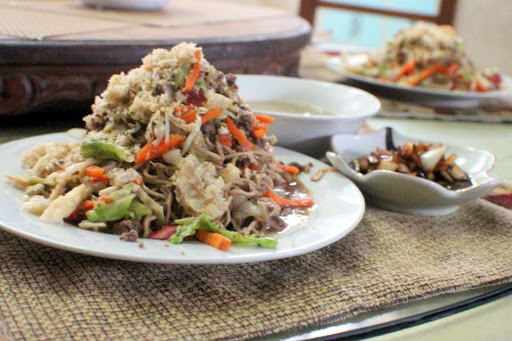 So if you're curious how this pancit tastes, I invite you to try making a plate for yourself. Enjoy! I was ROFL while I read this. Malou you are hilarious. I love this post to a tee. I'm craving batil patung now. Im glad you liked the post. I was nostalgic writing this too. Thanks for being the "first" to comment haha! I am not from Tugue but this has been a family favorite since you shared it over a year ago. Thank you for sharing another version. WIll surely make it again. Thanks Jenny. Let me know which one you prefer. Hahahaha!!! I enjoyed this all over again...I love your nephew's facial expression and Auntie Bess' pointers!! I must got to Lamud's during my next visit...I am still giggling! 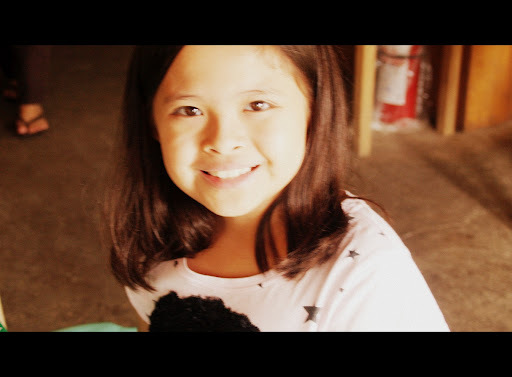 Love ya, Ading Malou..Thank you for this heartwarming post! the feeling is mutual and you know that. thank you for the laughter and "fun" over at FB. WIth you and Orly around it's like having a fun party all the time. haha. Now, I am hungry all over again!! that's why i shared the recipe here so you could re-create batil patung and you could have it by the beach pa haha. Lucky you. 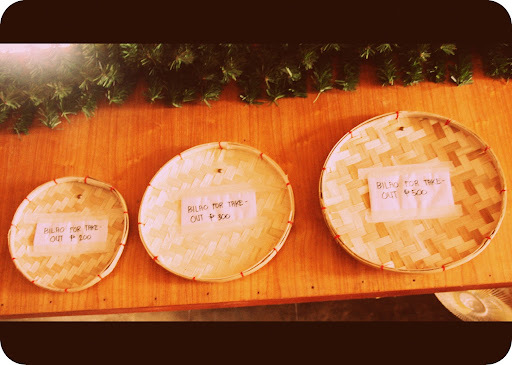 I miss SD naman tuloy! hehe. What a fun trip! I would happily make the journey - although my - it looks as portion control is as out of whack there as it is here! Thanks for introducing this to us! Love all the smiling faces! would you imagine if we even got the super special? haha. Im glad you enjoyed my post. Great to see you as always! I'm glad you enjoyed reading the post Mary. It's been awhile girl but glad to see you here. I was just so happy that we were able to capture my nephew's face right at that moment haha. Yeah his reaction is such a classic. I love it! yum... I am mostly a vegetarian (don't laugh) but from your description, they way it is prepared the love, i would totally eat that. glad that i could persuade you to eat this dish even if you are a vegetarian. hope everything is running great with your biz. thanks for coming! 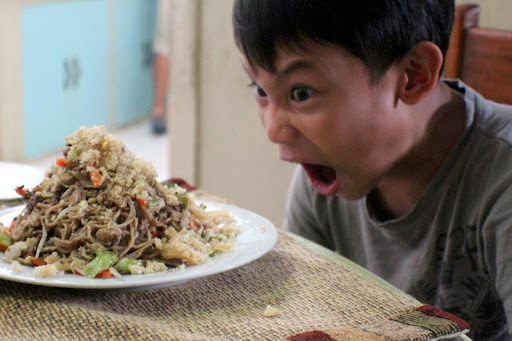 Hmmmm...this pancit is full of flavors! Never heard of Batil Patung, Malou. It's nice that I learn regional dishes everytime I visit your blog. 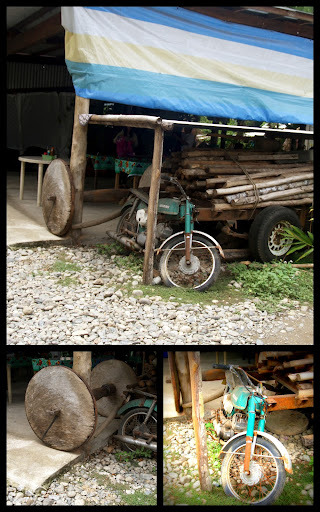 I try to share my Ibanag heritage Tina just as much as I want to share Filipino food. I love the pictures, what a great adventure. Wish I could visit and try some batil patung myself! Hahaha! you are hilarious! Always great to have you Maureen. Hi Hazel, indeed it was but the serving size is really one of its pampagulat factor haha. thanks for dropping by, i hope to see you around! Royal Soda! Love it :) I feel like my life has been missing something...with all my trips back to my family's house over the course of my lifetime I've never had this dish?! I'm missing out. Congrats for the upcoming feature, Malou! Another feather on your cap!!!! Bow! 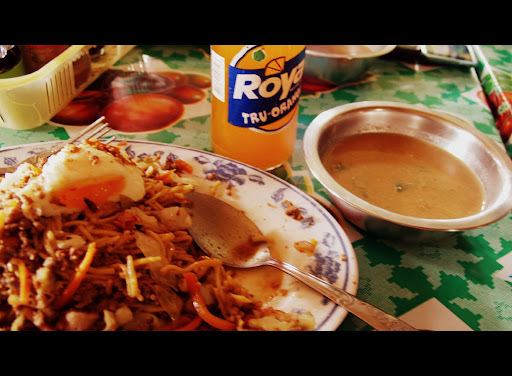 The best pancit for me...Nasinggo...everytime i'm visiting Tugue, pagkababa pa lang nang bus diretso pancitan agad.